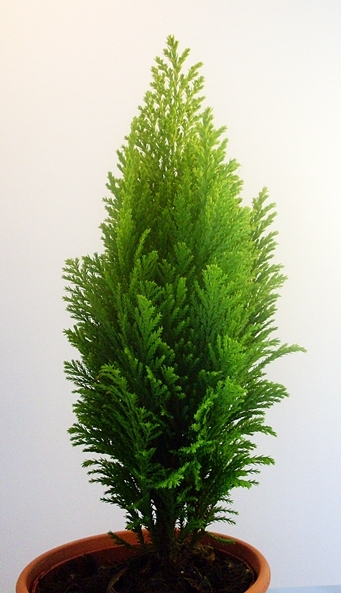 Little Cypress Tree – So Focused! Btw., I am not crazy, just a little bit, and yes sometimes plants kinda talk to me. They catch my attention and then somehow persuade me to take them home with me . And I feel sorry for the plants too, seing them in little pots in the super markets and then beeing thrown away when nobody buys them. So yes, my house and balcony is full of plants! Anyway I was just coming from a meeting with a parents school, where I will offer some workshops about Essential Oils, Bach Flowers and Herbal Medicine next year. And I thought, what a great way to talk about the Essential Oil of Cypress and show the plant. When you see a Cypress tree you will understand its uplifting, straight forward, focused energy! And even the little one I got, already shows this energy. Actually I dont know what kind of Cypress tree this is. I tried to do some research today, but couldnt find it out. It is probably a Lawson’s Cypress mini-tree. The Essential oil made from the Cypress tree, I have been talking about in previous posts, comes from the mediterranean Cypressus sempervirens. I wanted to share this with you, after talking so much about the essential oil. This Content (unless otherwise specified) by The Femme ADDon is licensed under a Creative Commons Attribution-NonCommercial-NoDerivs 3.0 Unported License.